Admission statistics and reports cover the application process from the preliminary entry of a students application, to the offer, and finally registration (acceptance of an offer, often referred to as the yield). Data is grouped into registration periods that span May through the following April. This includes the Summer session (May - August) and the following Winter session (September - April). Note, that the registration period is not the same as the UBC Academic year which runs September through August. We currently have data from 1995 onwards. Finalized data for registration years 1995 - 2004 were extracted on Feb-14-2006, and finalized data for registration years 2005 onwards are extracted each March 1st. Each of the following reports includes data on Applications, Offers, and Registration numbers for the specified registration periods. The March extract is the final report completed for each registration period. 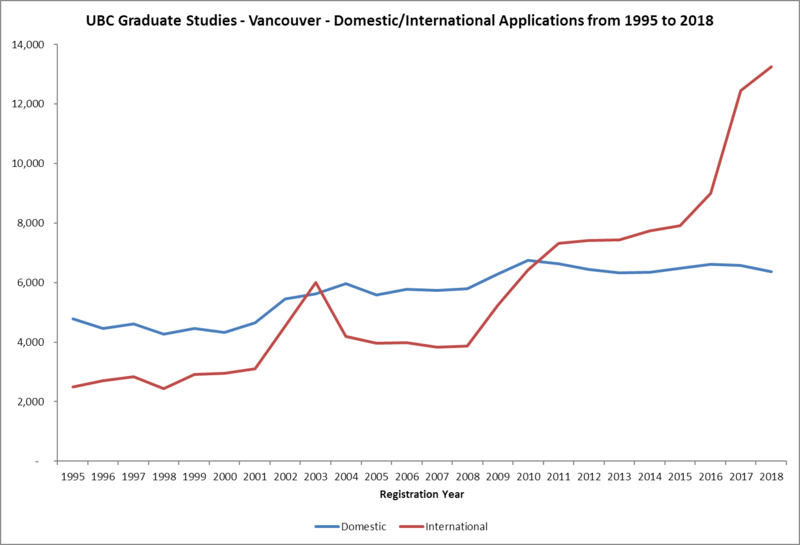 Over a 24 year cycle - 1995 to 2018 - Graduate Studies has had a 169.7% increase in applications. 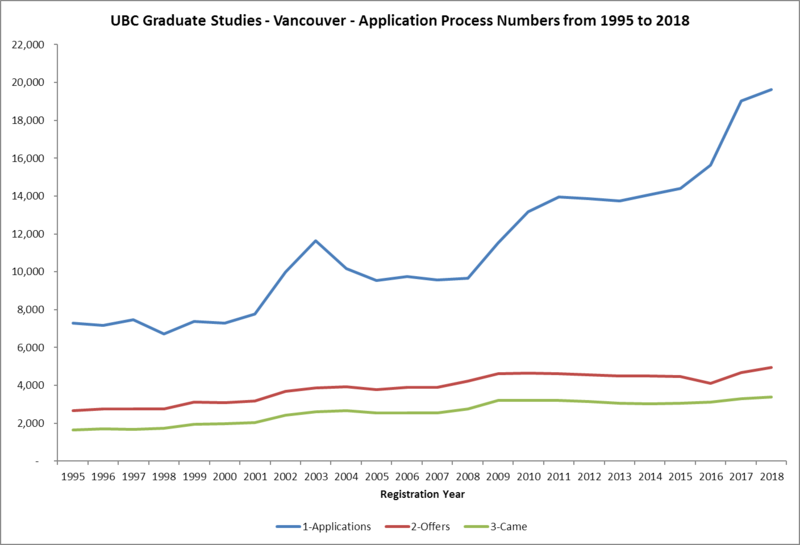 In 1995 there were 7,277 applications. By 2018 these numbers had increased to 19,626 applications. The average increase for applications was 4.9% per year. From an Offers perspective, there was a 85.8% increase in those same 24 years (a yearly average of 2.9%), going from 2,665 Offers made in 1995 to 4,952 Offers made in 2018. The final piece, Registrations, saw an 105.7% increase in 24 years (a yearly average of 3.3%). There were 1,640 Registrations in 1995 and 3,373 Registrations in 2018.